The item 150 useful English collocations, idioms, and phrasal verbs, H.E. Colby, (electronic resource) represents a specific, individual, material embodiment of a distinct intellectual or artistic creation found in Austin Public Library. Are you confused by English collocations, idioms, and phrasal verbs? Stop! By studying 150 Useful English Collocations, Idioms, and Phrasal Verbs, you will be learning some of the most frequent compound nouns, expressions, and phrasal verbs in US English. The collocations, idioms, and phrasal verbs used in the text are each defined with a sample sentence to show you how to use the phrase correctly. Each has been selected on the basis of practical experience using and teaching real American English - both spoken and written. Try the quiz after each section to test your understanding. 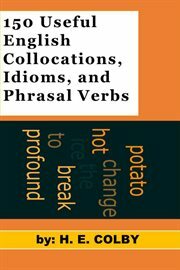 Get your copy of 150 Useful English Collocations, Idioms, and Phrasal Verbs and stop being confused by these common expressions. The text gives you key expressions at the tip of your tongue and full knowledge of how to use them so you achieve a feeling of native fluency. If your personal and/or professional success depends on confidently and fluently using English, then you need 150 Useful English Collocations, Idioms, and Phrasal Verbs!